10th Period: Charters Fixing Youngstown? Data Say, "Not So Fast." Charters Fixing Youngstown? Data Say, "Not So Fast." One of the key provisions of Ohio's new $71 million federal charter school grant is to, according to the state's cover letter, "Integrate quality charter development into the State’s new authority to create achievement school districts serving the children of the most dysfunctional school districts." But there is a major question: Should charters be seen as the rescuer of Youngstown City Schools? Recently released data would suggest that they should not, as I wrote briefly for Innovation Ohio. This is not to say Youngstown is any great shakes performance wise. Youngstown has struggled for years to improve their students' academic performance. But Youngstown's struggles are much less profound than Youngstown charters' struggles. And significantly less so. Let's look at the data, which I used to calculate each school's Performance Index (PI) in each proficiency test, along with Youngstown's PI (which is the state's amalgamation of proficiency performance and is used by the state to determine whether charter schools can open in a particular district with 120 being the highest possible score and 30 being the lowest) in each test. 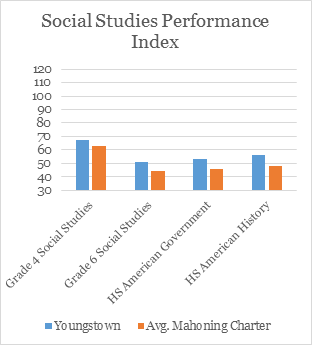 When comparing Mahoning County charter schools – the charters with the greatest percentage of its students coming from Youngstown, as well as the most obvious starting place to expand Youngstown’s charter footprint – with Youngstown, what becomes clear is that even the state’s lowest performing school district (according to the Ohio General Assembly) overwhelms its local charter competitors. 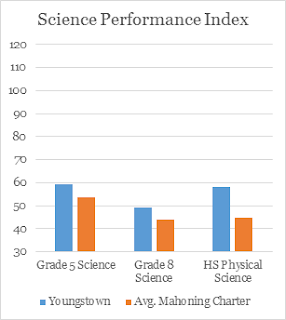 In only 1 of the 20 comparable performance tests do Mahoning County charters perform better on average than Youngstown – and that by a mere two-tenths of 1 percent. 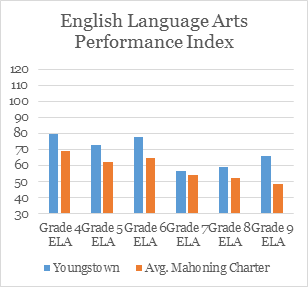 In the 19 other categories, Youngstown outperforms the average Mahoning County charter school by an average of nearly 14 percent, from as high as a 34.5 percent difference in 9th Grade English Language Arts to a 0.7 percent difference in 4th Grade math. In 13 of those 19 categories, Youngstown outperforms the average Mahoning County charter by more than 10 percent. Beyond just using the average scores, it is also rare for any Mahoning County charter school to outperform what the Ohio General Assembly says is the state’s worst-performing school district on any comparable proficiency assessment. In fact, Youngstown outperforms its individual Mahoning County charter school counterparts 2 out of every 3 times on comparable tests. 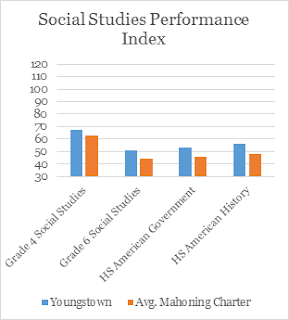 In no broad testing category (English Language Arts, Math, Science and Social Studies) do Mahoning County charters outperform Youngstown more often than not. 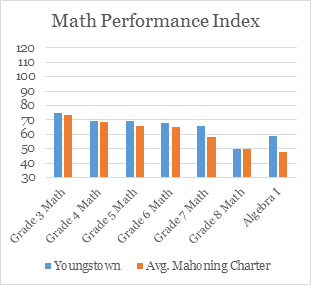 Only in math, where Youngstown outperforms its Mahoning County charter school competitors by a single case, is the count even close. While it appears the proponents of the Youngstown Plan seem intent on investing a large portion of the state’s controversial $71 million federal grant on expanding charter schools in Youngstown, the data suggest that there are few, if any, options in Youngstown that would provide better educational outcomes than the Youngstown City Schools. And at the very least, there are not enough high-performers in the Youngstown area to warrant a significant taxpayer investment in that area’s charter schools. Youngstown does not have a ready-made group of high-performing charters in whom to invest, unlike a city like Cleveland with its Breakthrough Schools. The new CEO should carefully consider whether expanding Youngstown’s poor-performing charter schools should make up a the lion's share of the reform.